Jem Quilliam, a Farmer – Tom Dodd. 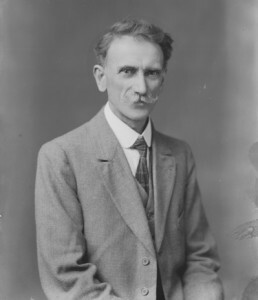 Kirrie Quilliam, his Wife – Annie V. Caine. Kaymad, a Neighbour – John J. Joughin. 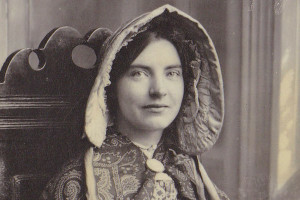 Pyee, an Old Beggar Woman – Amelia Keegan. Time — A Generation Ago. Scene — A Farmhouse Kitchen. KIRRIE QUILLIAM (despairingly) — What’ll I do? What’ll I do? Tha’s so much to be done, I don’t know where to begin arrit. The breakfast things to wash up. A drink for the calves to make. The churnin’ to be done. Eggs to gather. Jem’s trousers to mend, and tha’s no time goin’ to look after me own clothes. The washin’ left over from las’ week, an’ tha’ll be a big wash when I start. The house wants a run o’ clanin’, too, an’ tha’s no time goin’ to do it. Am ashamed o’ the crockery on the dressar. I’s that dusty i’s a clane shaw. Oh the tired I am, I could cry, I could cry. An’ I’ll hev to get the broth on for dinner, an’ a curran puddin’ made, or Jem’ll be that cross I’ll get no res’ at all. Only tha isn time I’d sit down an’ hev a good cry, I would. The sof’ I was to get married, an’ me so nice an’ snug as I was. Well, I was always a bogh, an’ i’s a bogh I’ll be to the end. Shee Bannee me! an’ here’s Jem. JEM (speaking crossly) — Here Kirrie, give the calves a drink, quick, an’ throw something to the hens, an’ run upstairs an’ get that thow I got las’ week. Am goin’ to the fair at St. John’s after dinner with the white heifer. Kaymad is goin’ to call about twelve o’clock, an’ we’ll go togather. Wha’s the woman waitin’ for? Get the thow, woman. (Stamps foot impatiently and shouts) — Are ye makin’ the rope? Are you gone to sleep? Are ye admirin’ ye ’self in the glass? KIRRIE (from above) — I’m comin’. JEM — Myghin y chairys, what a woman! KIRRIE (carrying a rope, part trailing under her feet) — You mus’ hev moved it, Jem. JEM (grabs rope) — Lif’ ye big feet, woman. Ye gor as many feet as a hen. Now give the calves a drink o’ male, an’ feed the hens, an’ give something to the pig to shut his row, an’ make the house look dacent for the time Kaymad will call, an’ get the dinner on, an’ don’t forget to pur a few currans in the puddin’. Come on, now. Be smart, an’ get something done. JEM (shouting in at door) — Don’t forget to pur a few stitches in the bottom of me trousis, an’ ye batter pur a lil rub on me Sunday boots, an’ get dinner ready soon! Mind now! JEM (comes in) — Well, how are you gettin’ on? Well, Guy heng! Whor a woman. She hasn’ got the dinner on yit, an’ me wantin’ to go to the fair soon. Whor ye goin’ to do with all that bulkan o’ turnips an’ priddas? Am sure am nor a big ater. We’ll not hev a turnip or pridda lef’ for the crathurs. KIRRIE (meekly) — If tha’s any lavins, the’ll do nice for the pig. JEM (noisily) — Did ye avar hear such a woman? Lavins! Tha’s navar any lavins when your done atin’. I navar saw the lek o’ you for atin. A lil bir of a miserable woman lek you ates more than a right body. Ye’r doin’ nothin’ but cookin’ an’ atin’ unless i’s lookin’ in the glass, ye are. KIRRIE — I’s not much tha’s doin’ me. JEM — Hear the woman! Talk, talk, talk! If i’s not atin’ she is, i’s talkin’. Give ye’r tongue a rest, woman. Ye’ll have it wore to the roots. Am wonderin’ ye jaws arn’ tired. Am wonderin’ ye can think of anything to say. Me head is weary listenin’ to ye. If I wasn’ here, ye’d talk to the birds. Ye’r tongue is like the clappar of a mill — navar stoppin, goin’, goin’, all the time. KIRRIE — Who’s talkin’ now? JEM — Who? You tha’s doin’ the talkin’ in this house. Ye’ll have the las’ word, as the man said before now. Did ye pur a stitch on me Sunday trousers? KIRRIE — Not yet. I will as soon as I get the pot on the fire. JEM — Aw, ye lhiggey my hraa! Did ye pur a rub on me Sunday boots? I asked ye special to do that. KIRRIE — I navar heard ye. JEM — Navar heard me! An’ me shoutin’ that ye’d hear me on the top o’ Slieu Whallin! KIRRIE — I’ll do them as soon as I get me hands clane. JEM — Jus’ now, traa dy liooar again, an’ she wants to clane her han’s before blackinin’ boots! No wonder ye’r so slow over the lil bir o’ work ye got to do. KIRRIE (begins to cry quietly) — Am doin’ me bes’. KIRRIE (crying, puts dinner on fire, gets trousers and starts mending, drying her eyes with corner of apron) — Jem is gettin wuss and wuss. I don’t know wha’s goin to become of us. He used to be nice, but now tha’s no pleasing him, no matter what I do. He’s gettin that cribbidjagh, wants everything done in a minute. If he gets any wuss, I’ll hev to lave him for a bit, and go to me mother. PYEE — I’s a fine growin’ day, Quilliam’s wife. That lil shower o’ rain last night done a power o’ good. KIRRIE (with back to Pyee, and drying her eyes) — Yis, yis. PYEE — The turnips is wantin rain bad. They’re sayin that down at the north the turnips hev failed, an’ lots o’ ones will hev to soo them again. KIRRIE — Yis, so I’ve heard. PYEE — So am toul. PYEE (observing Mrs. Quilliam is depressed) — Maybe ye not so well to-day, Quilliam’s wife. They’re sayin tha’s lots o’ people havin couls. Tha’s a kind of a murran goin, they say. Very like ye got the thing tha’s goin. PYEE — I’s takin’ them in the head an’ the eyes, they’re sayin. PYEE — Iss himself middlin? PYEE — He’s gone to the fair, maybe? KIRRIE — Not yet, Pyee. PYEE — I’s lek he’ll be goin after dinner? PYEE — A nice coar man. PYEE — Aw, a sogragh man for all. PYEE — A man tha’ wouldn’t be tuk in at all, though he’s not much for talkin. KIRRIE (off her guard) — Isn’t he! You haven’t heard him. PYEE — Well, but no harm arrim. Not meaning anything. PYEE — Men don’t understand house things, an thas so much to be done. They think things will get done of themselves. They’re not short o’ feelins, but they don’t understand. But theer jawin’ i’s hurtin’ all the same. Yis, yis, i’s hurtin’ all the same. KIRRIE — Yis, Pyee, i’s hurtin’ to be jawed after doin’ ye bes’. PYEE — Thou’ll get lave, tha’s the way it is. KIRRIE — Yis, thou’ll get lave. PYEE- — Thou’ll be goin to the fair with him? KIRRIE — No indeed! I never get any place; maybe sometimes chapel of a Sunday. (Finishes trousers and gets boots to black.) The pride vogh tha’s in some ones! PYEE (with feeling) — He should be clanin’ thy shoes, Mistress Quilliam. KIRRIE (with bitter laugh) — Clanin’ my shoes. I’d lek to see the day. PYEE — I’ve seen stranger things than that. PYEE — Indeed an’ I did. Av heard me mother tell of a man on the South side tha was always coorse on his wife, an’ at las he lifted his hand to her, so she come to me mother an’ got a charm put on him, an’ he was a changed man, as kind as kind, till he would do anything for her. KIRRIE — It didn’t take his senses anyway? PYEE — Nor a bit, only made him kind. KIRRIE — Didn’t affect his health at all? PYEE — Navar was stronger, lived till he was eighty-five, an’ smart with it. KIRRIE (sighing) — Them times have gone an’ the charm is lost, I suppose? PYEE — No, me mother toul it to me. KIRRIE — Am toul a woman mus’n tell a charm to a woman, or a man tell a charm to a man. PYEE — Tha’s true. She didn’t tell it straight to me. She toul it to oul Illiam Quirk, an’ he toul it to me an’ I navar forgot it. KIRRIE— An’ ye sayin’ it couldn’t do any harm? PYEE — No harm, at all, at all. KIRRIE — Theer now! An’ how would it be gettin’ done at all? PYEE — Aisy enough! Put a few herbs in the pot, an’ after dinner say the charm, an’ after a lil sleep he’d wake up a different man. PYEE (interrupts) — Here, put this in the pot (giving a little package). It must boil for a quile or it won’t work. PYEE — Nor a bit woman, don’t be such a bogh. (Earnestly.) Woman veen, i’ll do no harm, an’ if ye don’t mind I’ll come after dinner an’ hev some of the broth meself . KIRRIE (puts herbs in the pot) — Maybe ye could do with a pick o’ mate? I was that upset I forgot to ask ye if there was a mouth on ye. PYEE — I’ll call in after dinner an’ hev a basin o’ broth, an’ maybe a lil pick o’ mate an’ puddin’. JEM (entering) — Well, Kirrie, where ye goin’ with the broth? KIRRIE — To give it to the pig. KIRRIE (coaxingly) — I wouldn’t ate any broth, Jem. I’s bad for — for — for ones with weak hearts. Ate the pudding Jem, an’ I’ll make a cup o’ tay — ye’ll be quicker. JEM — Did ye do me trousers? Now when am away, watch the sheep won’t get through the gap into the corn. An’ try an’ get the churnin’ done in dacent time. (Grows drowsy, sits on settle.) I’ll jus’ sit down till Kaymad ‘ll come. That curran’ puddin’ is terrible for fillin’ ye up. KIRRIE (wakes with a start) — I’ve been asleep! An’ look at that big lazy gorm on the settle, fast asleep, an’ so much to be done. (Calls out crossly.) Jem! Jem! Wha’s the meanin’ o’ this? (Shakes him.) Come on, me dooinney moar. Is this the way ye’ goin’ to earn ye’ livin’? JEM (stupidly) — What is it? Wha’s the matter? KIRRIE — Wha’s the matter? Lyin’ sleepin’ in the middle o’ the day. Ger up this minute, or I’ll make ye. JEM (rising) — Aisy, woman! Give a falla a chance. I was only havin’ a res’. KIRRIE — Don’t hev so much to say. Ye tongue is goin’ raa, raa, regular, an’ am not goin’ to stan it. Here am slavin’ night an’ day, an’ you sleepin’ and takin’ ye res’ (scornfully). Here, try an’ help. Clear away the dinner things. Tha’s hot water in the kettle, an’ mind an’ not break any dishes. JEM — What batter I do fust? Where’s the dishclout? KIRRIE (brushing floor, hits him with brush. He ducks his head and holds up an arm to defend himself from blows) — Ye big, stupid gorm. Tha’ll not be a plate left in the house. JEM — Aisy woman, be as aisy as ye can. KIRRIE — Too long I’ve been aisy. I’ll aise ye, I’ll aise ye. (Hits him. He runs around cowering from blows, gets under the table, and defends himself.) Of all the boghs that a woman was ever tormented with, ye are the wuss — sleeping atin’, and talkin’ is all ye good for. (He puts out head furtively.) Keep ye head in, and keep out o’ me sight, ye big stahll. JEM (under the table signs to go away). KAYMAD (bewildered) — Wha’s the meanin’ of this? Whor ye doin’ there, Jem? Is herself gone erf her senses? Is she gone clicky? KAYMAD (outside) — Mind ye’self, Jem, boy. KIRRIE— Come out o’ there, ye big sof’ crathur, makin’ a gorm of yeself. Ye’ll be the talk o’ the whole parish. Here, do something, go an’ get the churn an’ bring the cream in, and get to work to see if it’ll take some of the fat off ye. JEM — I’ll be late for the fair, an’ we should try an’ sell the heifer. KIRRIE — Are ye arrit it again? Do ye want a taste o’ the brush again? Ye goin’ to no fair to-day. Am jus’ beginnin’ to see through ye carryin’ on. Ye thought I was sof’, did ye? I’ll tell ye when to go to the fair. I’ll tell ye when to have a rest. I’m the mistress o’ this house, an’ ye got to do what ye toul. Mind that, now. KIRRIE — Listen to the crathur. “He thought.” You’re not supposed to think. You’re supposed to do as you’re toul. Go an’ get a can o’ water, an’ don’t be long. (He goes out with can.) A thing lek that givin’ me back answers! (Waiting.) Is he ever comin’ with the water? JEM (entering) — Am thinkin’ i’s goin’ to rain. KIRRIE — Anythin’ else, don’t you bother to think! I’ll do all the thinkin’ for this house. PYEE — I’s a fine everin, Mastar Quilliam, a fine everin. JEM — I’s coorse weather in this house, Pyee. PYEE — Och, man, och! Is herself moal? JEM — Moal, thagraa! It’s the Bad Man tha’s in her I’m thinkin’. Tha’s bucheragh on this house. Herself is goin’ round with a whushan on her that I’m clane freckened. PYEE — Och, man, och! Notions thou’re takin’. JEM — No notions at all, Pyee. I’s the truth am tellin’. Herself is gone asgleden. Am posed with her. A lashin’ she’s wantin’, am thinkin’. JEM — ‘Deed! An’, Pyee, I’ve heard thou are good theeself for a charm, an’ for givin’ the herb. Here’s a shillin’, an’ do thee bes’ for us ; for this house is gone a clane shaw to the livin’. PYEE — I’ve heard me mother say that a lil luss ny chulg or a bir o’ vervine is good for the nerves. A lil bit in her tay now would do herself no harm. JEM — They’re good herbs, Pyee, but not strong enough for herself, an’ she would know the taste o’ them in the tay. PYEE — Aw, no, laa! I’ll put a lil charm on it, that me mother had, an’ the tay will taste lek the best tha’s goin’. JEM— Won’t do any harm, Pyee? I wouldn’t lek to harm herself for all. KIRRIE (entering) — Navar done churnin’ yit, an’ look at the house the man has got. Ye big straam! I’d be ashamed of people to see it. Put the churn away, an’ make some tay. Am perished for a drink. JEM — The butter will be spoiled. JEM — I had the queerest drame. I’s makin’ me laugh when am thinkin’ of it. Put a few herbs in the pot, an’ after dinner say the charm, an’ after a lil sleep he’d wake up a different man. The first performance of The Charm in the Peel in 1912 marked the beginning of the careers of both the Island’s most significant Manx dialect playwright and theatre troupe. Mr. Shimmin thanked the audience for their kind reception. He was a Manxman, and that was one of the few things he had to be proud of. There was one point he was very pleased of – the promoters, the players, Miss Morrison, and himself, were all Manx. The play was produced by the newly formed band of performers, The Peel Players, under the initiation and direction of that driving force behind the Manx cultural revival, the Secretary of the Manx Language Society, Sophia Morrison. The Players were to become the most successful theatre troupe of its kind, with The Charm and Illiam Kodhere’s Will, also by Shimmin, being taken to successful performances on the Gaiety Theatre stage in Douglas and across for performances in England even within a year. It was a high-point for Manx dialect theatre never to be seen again with the onset of the First World War and the death of Sophia Morrison in 1917. Well, well, life is only a drame after all, an’ let’s try an’ be jonnack while we are here.